Mongolian President Tsakhia Elbegdorj is a dedicated, progressive leader who has brought about many changes to benefit his nation. Soon after being established in office in June, Golden Year 6 (2009), he initiated an amnesty law to help free prisoners of war. On January 14, 2010, His Excellency announced that he would use his presidential rights to pardon all prisoners condemned to death, by commuting all such verdicts to 30 years’ detainment. He said, “The majority of the world’s countries have chosen to abolish the death penalty. We should follow this path.” Since his term began, not a single death sentence has been carried out. President Elbegdorj has always worked toward a transparent and honest governance, freedom of speech in the media, poverty elimination and environmental protection. At the December 2009 United Nations Climate Change Conference in Copenhagen, Denmark, His Excellency mentioned during an interview with Supreme Master TV that a conversion from livestock raising to vegan farming would be preferable for the environment and for his fellow citizens. 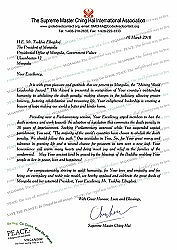 In recognition of the country’s outstanding compassionate action in making changes in the judiciary system that allow for greater leniency, fostering rehabilitation and treasuring life, Supreme Master Ching Hai granted the Shining World Leadership Award to Mongolia. 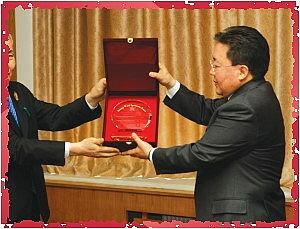 The Award was presented to President Tsakhia Elbegdorj on April 23 in his presidential office by our Association members. He graciously accepted this honor and expressed his sincere appreciation to Supreme Master Ching Hai. 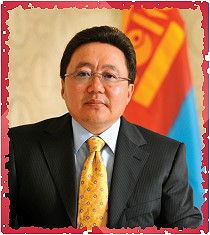 Our respectful congratulations, President Tsakhia Elbegdorj, for your noble stand in support of life and mercy. Blessed be such exemplary leadership in encouraging similar tolerance among all decision-makers, for the benefit of Mongolia and indeed the world.